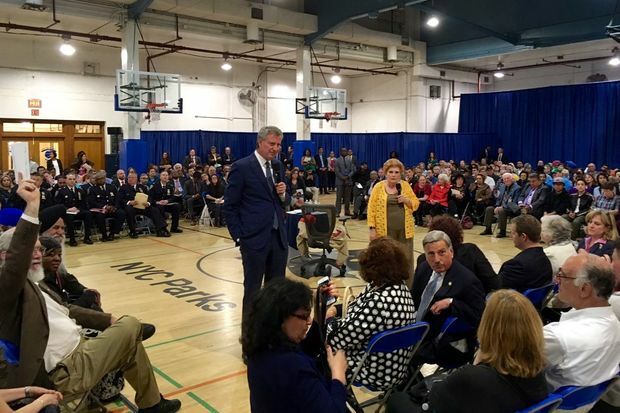 Mayor Bill de Blasio and Councilwoman Karen Koslowitz answer questions at a town hall held in Rego Park on June 8. QUEENS — The city will make a decision on the proposed QueensWay in the upcoming months, according to Mayor Bill de Blasio. “We are closing in on our final decision," de Blasio said at a town hall held Thursday in Rego Park, where residents from District 29 had a chance to ask him questions about local issues. The project has many opponents, including groups like the Queens Public Transit Committee, seeking to restore the train service, which they say would significantly shorten commuting time for thousands of Queens residents. The MTA is currently working on assessing whether it's feasible to reactivate the rail line which used to run from Rego Park to Ozone Park, before it closed in 1962. De Blasio said that while the MTA is analyzing the transportation option, the city is working on an assessment of how much the QueensWay and its future maintenance would cost taxpayers. According to the Friends of the QueensWay and The Trust for Public Land, which are overseeing the plan and raising money for it, it would cost about $120 million to build the park, featuring bike paths, outdoor classrooms and cultural amenities. During the town hall de Blasio was also asked about his opinion regarding the crumbling Long Island Rail Road bridge in Kew Gardens, home to several mom-and-pop businesses which may face demolition as the MTA tries to figure out what to do with the aging structure. “I don’t know all the facts about the bridge, but I do know tearing down the bridge would destroy your businesses and I don’t like that,” he said to the several store owners who attended the town hall. “I understand the lease goes to 2020,” said de Blasio, adding that while he does not appoint the majority on the MTA board, his seven appointees will use their seats to support the Kew Gardens shop owners. “It’s only 2017, so they need to fix the properties now, they have an obligation and we will work to enforce that," he added. The MTA said in a statement last week that it is “committed to working with the community to find the best possible outcome for this location," but did not provide further details.